A key Palestinian religious leader is warning that there will be war if the United States follows through on its announced plan to open an embassy in Jerusalem, which Washington now formally recognizes as Israel’s capital. The threat, according to Palestinian Media Watch, comes from Sheik Muhammad Hussein, the grand mufti of Jerusalem. Palestinians and much of the world community is deploring the announcement. The USA, Israel, and a few other nations support it. But some consider the move of the US Embassy to Jerusalem as prophetic. This problem of Trump’s revelling in his sinful behaviour is mitigated for some evangelicals by the ‘evil kings’ narrative. Jack Jenkins of Religion News Service described for us the Cyrus analogy of an evil king who comes through for God’s people, so is tolerated and even thanked for having made provision for the needs and priorities of faithful believers. And as I reported here previously, there is now a coin from the Sanhedrin with an image of Donald Trump and Cyrus (see Sanhedrin Mints Silver Half Shekel With Images of Trump and Cyrus: Is the ‘third temple’ necessary for a successful Trump presidency). Some believe that Donald Trump will cause a ‘third temple’ to be built in Jerusalem. Essentially, this mainly has to do with prophecies related to animal sacrifices, though according to the Bible (see Ezra 3:6) and the Sanhedrin (see Why is a Jewish Temple in Jerusalem Not Required? ), an actual ‘third temple does NOT need to be built for sacrifices to resume. Bible prophecy shows that they will be stopped by the King of the North (Daniel 11:31) who will align with the final Antichrist. Yes, war or other regional conflict is possible. One day, the nation of Israel will lose territory (for details, see the prophecies in the article Gaza and the Palestinians in Bible Prophecy). Ultimately, and probably after conflict, a temporary peace deal will be put in place (cf. Daniel 9:27; see also The ‘Peace Deal’ of Daniel 9:27). But this will not end as hoped by the USA (cf. Daniel 11:39; see also USA in Prophecy: The Strongest Fortresses) or Israel (cf. Daniel 11:31). Despite certain Jewish and American hopes, steps are moving in this direction. This entry was posted on Wednesday, February 28th, 2018 at 3:00 pm	and is filed under Prophecy. 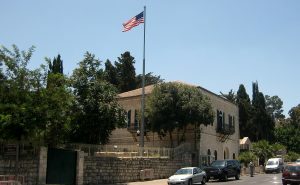 US Embassy in Jerusalem: Will it last?